If you’ve never cooked asparagus at home before you may have asked yourself how do I know what asparagus is best to buy when at the store. Check out our 5 tips for buying asparagus to get the most out of this delicious and affordable spring vegetable. I must admit that I used to not care much for cold weather. But, as I get older I’ve come to appreciate winter and its cooler temperatures more and more with each super hot and humid summer here in the south. By the time February rolls in, though, I have spring on the brain and can’t wait to start enjoying fresh, crisp produce again. The season usually starts with one of my favorites, asparagus. It always surprises me just how many people have never bought nor cooked fresh asparagus before. I eat a lot of both canned and frozen veggies, but, in my opinion, asparagus is one of those vegetables that is by far the best fresh. 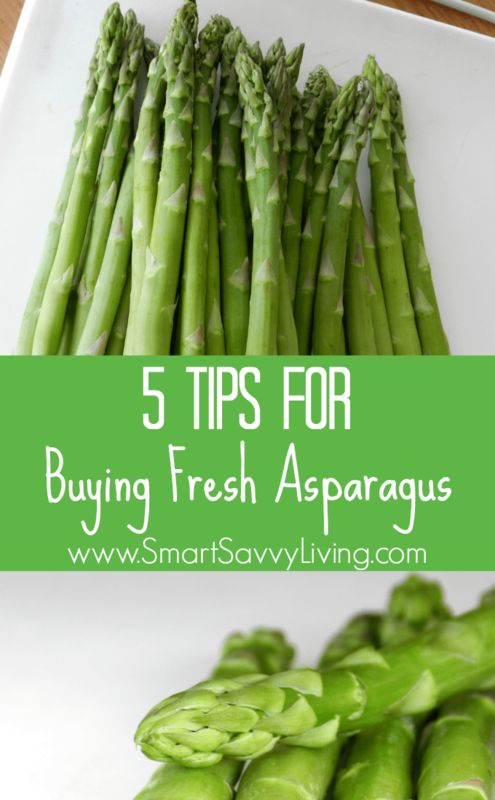 So, today I’m encouraging you to give fresh asparagus a try if you haven’t before and sharing these 5 tips for buying fresh asparagus. You can usually find asparagus year round here in the US, but it can be rather expensive when out of season. The typical season is late February through June, with the prime month being April. 1. Color – Did you know that asparagus can be purple, white, or, most common here in the US, green? 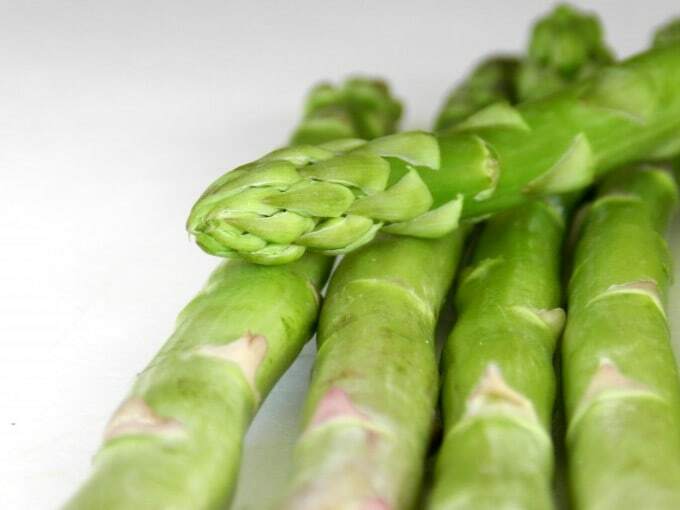 When buying green asparagus, look for stalks that are a bright green. The tips may have a bit of a purple color, which is totally natural and perfect to buy, but stay clear if the tips are a very dark green, or almost look black as the asparagus is likely past its prime. The tips should also be tight and fully closed. The tips may have a bit of a purple color, which is totally natural and perfect to buy, but stay clear if the tips are a very dark green, or almost look black as the asparagus is likely past its prime. The tips should also be tight and fully closed. It shouldn’t be flexible at all and instead, snap off. The asparagus tips shouldn’t look at all wet, while the cut ends should look freshly cut and not dry. 3. 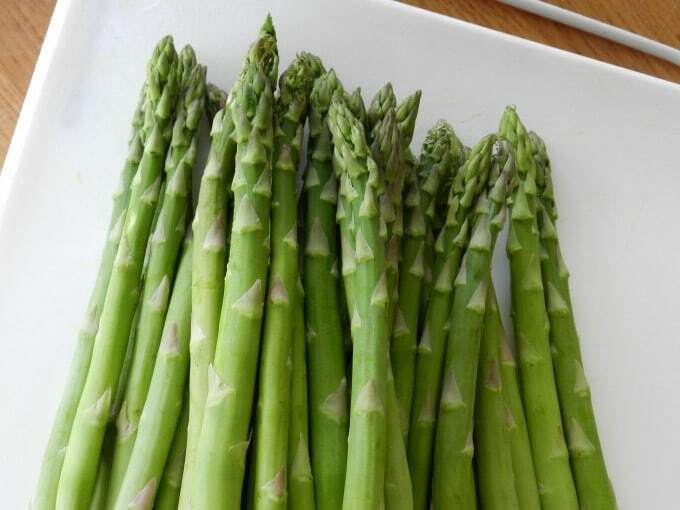 Size – A lot of people say that the thinner the stalk of the asparagus, the better. From my experience, it’s true that the thinner the asparagus, the more tender it is, and that the really large asparagus tend to have a bit more texture. I personally think both are great, though, and just need a different cooking method. Smaller spears are great for quick cooking like blanching and in stir-fries. Thicker asparagus does well with higher heat cooking such as roasting and grilling. To me, the most important thing is that all the asparagus in a bunch is of similar size so it all gets done at the same time. 4. Refrigeration – As I mentioned before, asparagus doesn’t last very long once cut and will start losing flavor quality quite quickly. If possible, cook and eat your asparagus the same day you buy it. But, you can also store it in the fridge for a few days, preferably placing the cut ends in a glass filled with just a bit of water (changed daily) or at least wrapping the cut ends in a damp paper towel. Asparagus also doesn’t reheat that well so only cook as much as you’re going to eat that day or be prepared to use the leftovers as a cold snack or chopped up cold to add to a salad. 5. Getting Asparagus Ready To Cook – Luckily asparagus is one of the easiest vegetables to prepare. All you really have to do is get rid of the woodier ends, then season and cook as desired. You don’t even need a knife. Just grab an asparagus stalk with both hands and snap it. The woody part should naturally break off. Rarely larger stalks will have tougher exteriors which can be fixed by a quick peel with a veggie peeler, but this isn’t something I’ve ever had to do before. What are some of your favorite ways to enjoy asparagus?